The use of analytical biochemical techniques with different separation properties allows us to better understand the proteome. To demonstrate this we have used two different methodologies to analyze embryos from a Tunisian cultivar of durum wheat (Triticum durum Desf. ), variety Oum Rabiaa. We compared conventional 2D electrophoresis with liquid-phase chromatography. Our results show that a similar number of proteins were detected with both techniques. However, analysis of protein resolution at different pH ranges showed significant differences. By using a large pH gradient we observed that liquid chromatography presents higher resolution at extreme pH, either acidic or basic. Conversely, 2DE is more resolutive at intermediate pH (pH 5–6.5). 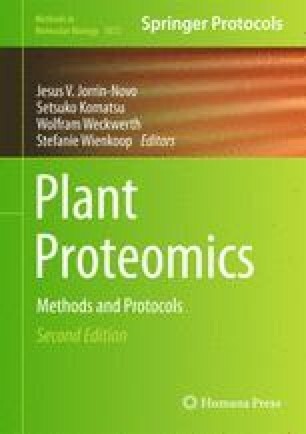 Taking these results in consideration, we propose that 2DE and liquid chromatography are complementary methods to analyze complex protein extracts and can be used in parallel to acquire a wider perspective and a better understanding of the embryo proteome. This work was supported by Bio 2009-13044-Co2-01 from MICIN.